PREPARING for the 2017 Larchmont Family Fair are (princess) Nikka Gueler, Luke and T.J. Brunelle, Sam and Max Terr. In the back row are Vivian Gueler and Betsy Malloy, co-chairmen, and John Winther, Larchmont Boulevard Assoc. president. Photo by Bill Devlin. 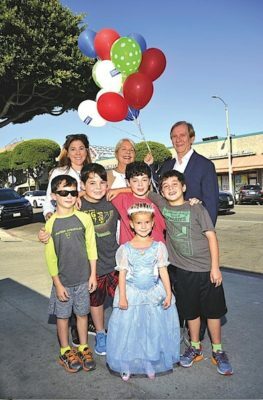 Billed as “Main Street U.S.A.” in its premiere year in 1966, the Larchmont Family Fair — sponsored by the Larchmont Boulevard Association and founded by the Larchmont Chronicle — still has its small-town charm. A spooky haunted house, a talent show for all ages and a children’s Halloween costume contest are among activities at the fair Sun., Oct. 28 from noon to 5:30 p.m. on Larchmont Boulevard. Traffic will be blocked on Larchmont from Beverly Boulevard to First Street. The haunted house was such a hit last year that it will return, scarier and better than ever, said fair co-chair Vivian Gueler. The haunted house is courtesy of St. Brendan School. Water-on-water Bub-ble Rollers are among the other 20 rides sure to thrill at the 52nd annual event. New to the fair this year will be a pie-baking contest judged by top-notch celebrity chefs, food writers and/or bakers, added Gueler. Loveland Carr Properties will oversee the cooking contest, while John Duerler of Hancock Homes Realty will host a pie-throwing event. Returning to the fair after a years-long hiatus is Third Street Elementary School. “In 2017 we had roughly 16 schools that took out booths at the fair — both private and public! We anticipate the same or more this year, with Third Street Elementary having committed to a booth, something they haven’t done in the last several years,” Gueler said. Bring your best song or dance, magic act or jokes to an audition on Sun., Oct. 21 between 10 a.m. to 3 p.m. at Coldwell Banker South, 251 N. Larchmont Blvd. Selected contestants will perform on stage at the Fair, Oct. 28 at 2:30 p.m., for local judges and all to enjoy. Cash prizes will be $500, $250 and $100 for first, second and third place winners, added Gueler and co-chair Betsy Malloy. The children’s Halloween costume contest, sponsored by Coldwell Banker, starts at 1 p.m.
Foods from around the world will be served: Korean barbecue will be offered by St. Brendan School, an In-N-Out Burger truck will be parked at the site, and local restaurants will be open. Email Betsy@betsymalloy.com for booth applications. Corporate sponsors can email vgueler@pacifictrustgroup.com.